Freebie quickie: Eyeshadows, eyes, and jewellery gifts at Musa! Another post from me today, to give a quick heads-up of some great little makeup, eye, and jewellery freebies at Musa! This link will take you upstairs at the store and, if you look on the wall by the stairs, you’ll see some lovely eyeshadows. Under the main images the word ‘tester’ is in mesh letters. Click that, and you get a wearable freebie single-colour sample of that eyeshadow! The ones with ‘demo’ underneath them have ‘demo’ written somewhere on the face, but the ‘tester’ ones are fully wearable. As a bonus, they include not only Omega appliers (which will work on any mesh head, with the correct Omega relay) but also tattoo layer makeup for classic avatars! Finally, cam downstairs to find the Subscribe-o-matic kiosk. 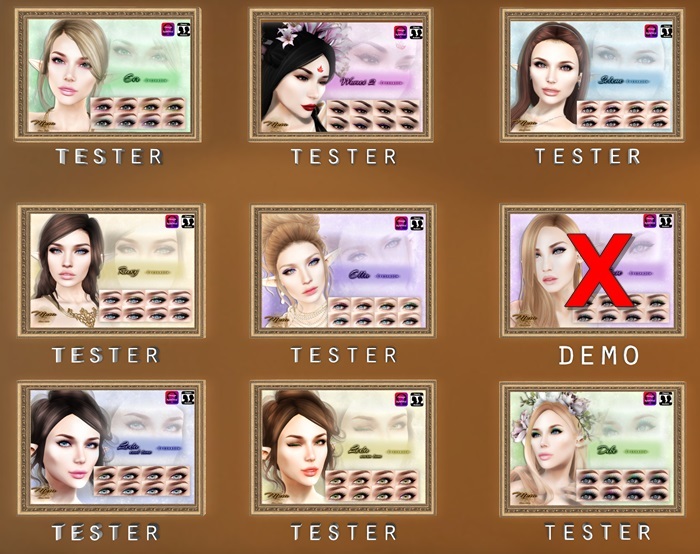 If you join up (it’s free and doesn’t take up a group slot) you’ll get a gorgeous eyeshadow palette in 8 colours (Omega appliers and tattoo layers) plus some earrings with a massive 16-colour customisable HUD plus 5 metal options! Fish up a bag of goodies at [email protected]! In the pink with 7 Deadly Skins & Legendaire!